With pay TV costs soaring, is it time to cut the cord? July 29, 2018 at 12:01a.m. In 1948, over-the-air television broadcasts began with four networks – NBC, CBS, ABC and the DuMont. But rabbit ears were replaced by miles of cable in the 1970s. Cable television had 16 million subscribers in 1980, and peaked in the 2000s, at 68.5 million total subscriptions in the U.S. In the 1990s, TV viewers also fueled the rise of satellite TV subscriptions. Over the past decade, the cost of cable and satellite TV has risen almost twice as fast as inflation. Cable and satellite TV monthly bills have increased 53 percent since 2007, with the average consumer now paying more than $100 per month for service. While most homes now receive more than 200 channels via cable or satellite, adults 55 and older watch fewer than 25 channels each month, according to a 2016 Nielsen report. Last year, 22.2 million people in the U.S. cut the cord on cable or satellite – up 33 percent from 16.7 million in 2016, according to research firm eMarketer. Likewise, the number of consumers who never have subscribed to pay TV will rise 5.8 percent this year, to 34.4 million. Armed with antenna and a la carte selections fueled by the internet, over-the-air – or OTA – TV is on the rebound. Consider the savings: If you pay $100 per month plus $15 for a premium channel such as HBO or Showtime, you’ll pay just under $7,000 in five years. If you watch any of the prime-time shows on ABC, CBS, NBC, Fox, PBS, The CW (and many more), here’s something to consider: They are all free with an antenna. Now that everything has been broadcast in digital HD since 2009, this means you will get the same clear picture as the one you watch if you are paying for cable or satellite TV. An investment of about $1,000 to cut the cord means you could pocket thousands of dollars in coming years. If you simply want OTA broadcast, you just need an antenna and a TV. To see how many free channels are available in the Youngstown area, enter your address into an OTA reception website (there are several; I found TVfool.com to be one of the better options) and add an estimate of how high your antenna will be to get an estimate of how many channels you can receive. Reception for digital television will vary by location and the type of antenna used. For my first cord-cutting experiment, I tested with a cheap indoor antenna, which found 17 channels available. After having an outdoor antenna installed with an antenna rotator, however, my number of channels increased to more than 70, including those from Cleveland; Erie, Pa.; Akron; Canton; Wheeling, W. Va.; Steubenville; and Pittsburgh. Raymond and Theodore Ray, owners of Ted Ray Antenna Service of Warren, have seen an increase in their business in recent years. “The main reason [people are cutting the cord] is eliminating the monthly cost of cable or satellite,” Raymond said. Other reasons include the increase in options of streaming shows and movies from other services such as Netflix, Amazon Prime Video, Hulu – all available on streaming devices such as Roku, Amazon Fire TV and Stick, and Apple TV and on gaming systems. Though an indoor antenna will receive the local channels, the Ray brothers recommend an outdoor antenna with an amplifier, which will increase your number of channels from under 20 to 50 or more channels in a 60- to 70-mile radius, depending on your location and what equipment is needed. 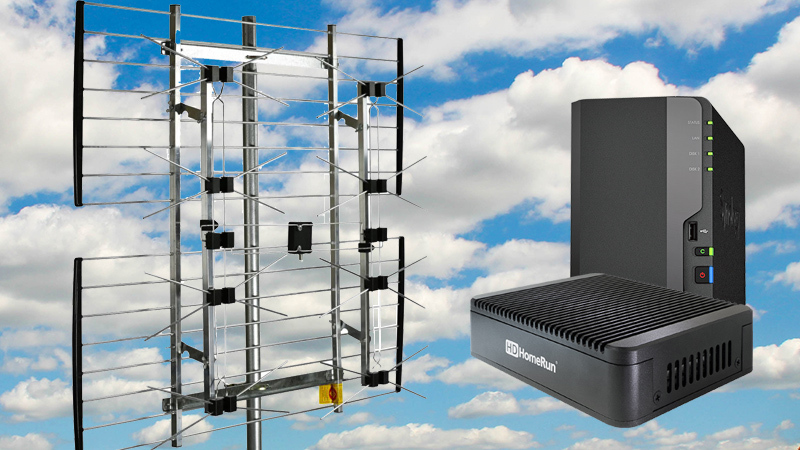 An outdoor antenna system will range between $550 to $750. “Consumers are extremely happy and surprised at what channels they receive and the clarity that antenna reception brings,” Raymond added. Most people cutting the cord also want to maintain the experience they had with the cable or satellite options, just without the high fees. What about the equipment that others used to just provide and install? You get to shop for them and install them. Yes, you get to be your own cable guy. Also, like many people, my busy life means watching TV shows live is difficult. I desired options that mirrored the cable or satellite experience. In my research, I sought multiuser, multiroom, multidevice ability, and I wanted the ability to record multiple shows at the same time with a DVR service and watch when I had time. Once you get an antenna, you will need a streaming player or a smart TV to download your channel apps. You will also need a DVR (Tivo, Channel Master, Roamia) or a DVR service (HDHomeRun, Plex) for recording of shows and movies to network-attached storage (NAS) hard drives attached to your home network. A network-attached digital TV tuner will connect to an antenna and take the digital TV signals and make them available to your computer, tablet, smartphone, gaming consoles or other streaming devices over your home network. There are several options to choose from, so first you need to decide what is important to you. I needed a multituner device so I could record multiple shows at one time. This led me to SiliconDust’s HDHomeRun Connect line of digital tuners. The Connect Duo (http://bit.ly/2jzCqu9) offers a two-tuner ($100) or Connect Quatro (http://bit.ly/2I37Hk0), a four-tuner option ($150), meaning you can watch or record two programs or four programs simultaneously in full 1080 high-definition. Depending on how many shows you record that air at the same time, it seems the Quatro is the safer bet for heavy TV consumption. If you are looking to stream incoming video over Wi-Fi, you should consider HDHomeRun Extend model ($180), a two-tuner model (http://bit.ly/2rqG90R) which features a hardware h264 transcoder which compresses video in real time for lower bandwidth usage. The setup is fairly simple. Hook the device onto your antenna with a coaxial cable, then attach the device into an ethernet switch, and it is now active on your home network. Apps for the tuner can be downloaded to your Windows or Mac computer, to your tablets or even smartphones. It also offers apps for streaming media players as well for Windows 10, Apple, Android and Amazon Fire TV and more, which offers local channels and your streaming services all in one format. Live TV can also be watched and recorded with Kodi/XBMC Add-On, an open source home theater software. Once the software is loaded onto the device you will be using, launch the app called HDHomeRun, and scan for TV channels. The app also incorporates a 24-hour program guide on the free app, or 14 days if using the annual subscription. HDHomeRun products allow you to watch live TV wherever you want in your home, even if another family member is watching a different channel, even on a different device, even in another room. To be able to use your tuner, you need to have a smart TV (a TV with internet capabilities or advanced computing ability and connectivity) or you need to purchase a streaming device that converts your television to a smart TV. I opted for the Amazon Fire TV with ethernet-adapter (video streaming is more efficient with hard wired Cat5 or better RJ45 networking cords). Attach it into your home router. With a smart TV or a streaming media player added to your television, your TV can now download apps for most of the premium channels you watch on your cable/satellite service. Fire TV, for example, with Amazon Prime membership, gives you access to more than 500,000 movies and TV episodes and apps including Netflix, Prime Video, Hulu, HBO, Showtime and most of your basic cable channels as well as TBS, TNT, History, Discovery, and weather and news channels. To complete your package, you need to compare the DVR options and storage. If you want easy and simple, SiliconDust HDHome-Run’s DVR service (http://bit.ly/2I0C9uW) doesn’t require an always-on computer (or additional media center software). It works with network-attached storage (NAS) devices. It requires little configuration, perfect for those who are tech-challenged. That DVR service costs $35 a year. HDHomeRun tuners are made to be compatible with computers, hard-drive storage options and devices you use to watch TV. If you are familiar with computers and home networks, another great DVR option is Plex Live TV & DVR service (https://www.plex.tv/). It costs $5 per month, $40 yearly or $120 for a lifetime subscription. It also requires a NAS-drive, and you will need to check which drive will work with your setup (http://bit.ly/2rlvaWr). Plex supports most streaming devices and will record, transcode video (to make smaller file sizes) and even remove ads from over- the-air HD signal. Your initial cost and set-up to cut the cord could range from $600 to $1,500, depending on your individual needs. For example: Amazon Fire TV-plus-ethernet: $85 (watch for sales: during Amazon’s Prime Days, these were $50); SiliconDust HDHomeRun tuners, $99 to $190; a DVR service, $35 yearly to $120 lifetime; a NAS drive, $270 to $500; and an outdoor antenna, $550 to $750. It is still in the range of about six months to one year’s worth of cable or satellite provider bills. For that price, you can have a complete system of smart TVs, DVR and lots of viewing options. After six to 12 months, it is all savings. No more TV bills. And pay only for the apps you want. If you use AT&T as your cellphone provider, the company recently announced a new free streaming service called WatchTV for all unlimited plan subscribers. It includes 31 channels – including most of the popular cable channels. No sports channels, however, are currently offered. If sports is a must, you can buy ESPN+, which includes MLB, NHL, MLS, college sports, boxing, golf, tennis and other events. The monthly cost is $4.99, and it will be viewable on ESPN.com. or its app. TV is changing. The days of the family gathering in the living room to watch television together are gone. And it is the adults in the 18-to-34-year-old demographic who are changing how TV programming is now being offered. This group, heavy users of the internet, spend more time watching videos from online on smartphones and tablets than through traditional viewing. After cutting the cord, I get the same channels as before for the most part, but I have to watch my DVR shows on one app, and I have to go to each channel’s streaming app to watch their programming. Is it hard? No. It just takes more thinking about what I want to watch, and where it can be found. Does anyone still need cable?